Two weeks of consolidation within geometric support and resistance ending has created an imminent breakout move for Litecoin – and it’s sitting right on that key level. Litecoin (LTC) has officially had the best performing quarter – ever. That’s quite an accomplishment given cryptocurrencies have been in the longest bear market in history. What is equally impressive is the total performance. From January 1st, 2019 to March 31st, 2019, Litecoin has risen from $30.19 to a high of $61.21 – that’s a +106.03% gain. But we shouldn’t discount the massive move Litecoin (LTC) has had ever since the 2018 low of $22.17 on December 14th, 2018. From that low to the 2019 high Litecoin has recorded an astounding +180.65% gain. Easily outperforming not only the majority of the aggregate market and outperforming nearly all of the top 10 market cap cryptocurrencies. This move up was met with some concern and reservation. Like almost every rally over the past 400+ days, Litecoin has experienced strong and persistent selloffs whenever a rally has occurred. That a selloff didn’t happen is a very impressive sign of both the strength behind Litecoin’s move and the health of the bullish nature of the entire cryptocurrency market. After such an important and bullish move, one would expect there to be some type if retracement. Instead, prices have consolidated. This is a very, very big deal because it indicates that buyers overwhelmingly overpower sellers. More than that, consolidation after a big move instead of a retracement is generally indicative of a trend continuation – which would mean higher future prices. For the past two weeks, Litecoin has consolidated between $57.75 and $61. The 1/8th Major Harmonic has, predictably, held as a major support level. The next zone ahead is key. Litecoin (LTC) is currently sitting right against a key resistance area – the 45-degree angle. When the current daily candlestick is complete, Litecoin will have moved beyond that angle. If Litecoin breaks that angle, then there is a clear and open space for it trade until it reaches resistance at the 2/8th Inner Harmonic at $71.44. I would predict that that would be a very normal and reasonable area for price to move to and I would expect that to happen sometime between today and April 7th, 2019. April 7th is the 50% time level in the current Law of Vibration cycle. If price does move all the way up to 71.44 around April 7th, a pullback to the 1/8th Major Harmonic at $57.75. 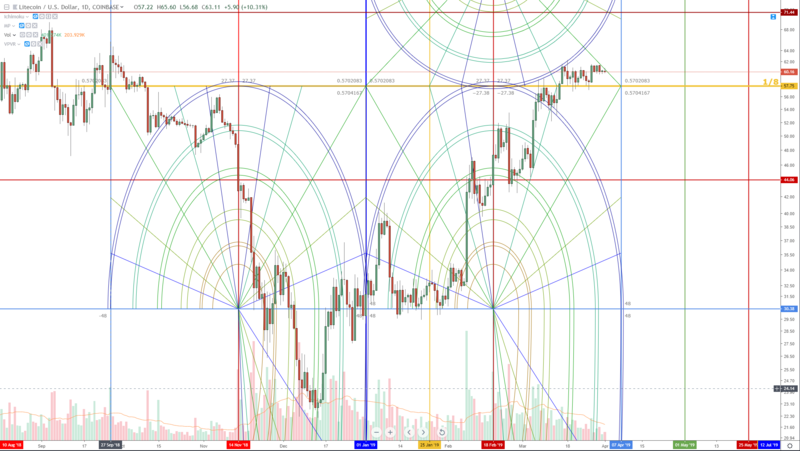 However, the Foldback pattern (not shown) indicates that price may oscillate around the 1/8th Major Harmonic for about a month and then continue to move higher. When might that happen? Not very long after April 7th. Around April 15th is when that move could occur. Litecoin’s Q1 performance could easily be outdone during Q2. Following the same Foldback pattern, Litecoin could very easily move to the 3/8th Major Harmonic at 167.25. I don’t find that kind of move very likely given the amount of resistance up ahead and the strength of the bear market that had existed for over 400 days. I would predict and anticipate some strong pullback and profit taking prior to any move up to and beyond the 3/8th Major Harmonic.